You’ve probably seen or used one of those folding, portable project centers. They feature adjustable, clamping tops that come in handy for light-duty work. But I’ve never found them suitable for more demanding woodworking. This version solves that problem. 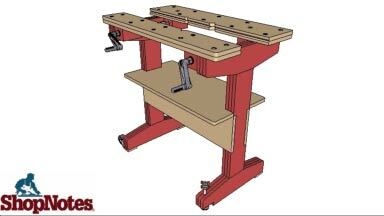 It features a rock-solid base with a large shelf for storing your tools while you’re working. And with the top’s array of dog holes, notches, and grooves, you won’t have any trouble clamping just about any workpiece. It’s a project that’s sure to earn a permanent spot in your shop.